It’s Saturday, the final weekend of the Sundance Film Festival, as as the award announcements are wrapping up in Park City, I am back home in relatively warm Los Angeles getting back to the business of programming a springtime Asian Pacific film festival set for four months hence. While I was excited for just about all the feature-length works I viewed during my four whirlwind days in Park City, I find myself holding off on my comments of Evan Jackson Leong’s LINSANITY, which had its World Premiere screening the first Sunday of the Festival in front of a packed house at the MARC Theatre, in reality a screening room erected within the confines of a huge racquet club. I thought I was ready to weigh in on my thoughts on the film as soon as I walked out of the theatre and returned home that evening, yet a lengthy conversation on the film with L.S. Kim, a media arts professor from UCLA, stopped me dead in my tracks and compelled me to let my thoughts marinate, even as the mainstream press has already weighed in on director Leong’s film. First off, some full disclosure: while I consider myself supportive of Evan’s work dating from his 2002 documentary BLT: GENESIS, I have to admit that I was not a fan of his previous long-form feature, 1040: CHRISTIANITY IN THE NEW ASIA. While the topic of Christianity in 21st-Century Asia was a compelling one, I found myself repelled by what I perceived to be a decidedly blatant Christian propagandistic narration as told by the film’s main subject, Jaeson Ma. The imperialistic “colonization” of 21st Century Asia by way of Christianity as advocated in 1040 proved to be a turn-off for me, a “reformed” Catholic who these days regards artifacts as The Bible to be a tool of white Western imperialist thought-control. Knowing from news footage and written accounts of Jeremy Lin’s Christian faith and director Leong’s already polarizing track record in tackling the subject, I walked into the screening bracing myself for a viewing experience weighted down with Christian proselytizing. Before I get to my post-screening debriefing with L.S., the film: I found myself pleasantly surprised and actually left the screening inspired by LINSANITY. An examination of that magical February in 2012 when Jeremy Lin, a prep school and Ivy League phenom from Palo Alto, CA whose Taiwanese ethnicity was arguably responsible for his getting marginalized by pro basketball tastemakers, turned around his own fortunes and that of the New York Knicks with a spectacular run that propelled the team to the cusp of the NBA playoffs and Lin himself to worldwide stardom, culminating in a multi-year contract with the Houston Rockets where he is currently helping the Rockets battle to a possible playoff berth. Skillfully using a combination of family home movie and NBA footage, filmed interviews with Jeremy, his parents and siblings and past coaches and teammates, and a narrative driven by the vocal talents of actor Daniel Dae Kim, LINSANITY is a uniquely “only in America” success story, only that the hero in this film negotiates additional layers of complication to the narrative — his Taiwanese American heritage; his Christian faith; negotiating his own ego as a high-school and college superstar; and the racism that he continues to encounter every step of his still-young career as an NBA star. In painting a portrait of a young man still in-progress, LINSANITY is even-handed in its treatment of a modern Asian American hero, and, as best as I can tell, speaks to today’s generation of young people regardless of race. The matter-of-fact mention of Jeremy’s faith was a relief, though the film did come close to deifying him in a couple of shots that were filmed specifically for sporadic transitional scenes. While my own fears of Christian propaganda in LINSANITY were largely mollified (for another take on the matter, I’m providing a link to my colleague Anderson Le’s take on the film here), it was the matter of race in the film that provided much food for thought before I resumed my marathon day of Sunday screenings. While visiting outside the MARC Theater with old friends who I hadn’t seen in awhile and who made the trek to Park City to be among the first to witness LINSANITY, I ran into L.S., a Film and Digital Media professor at UCLA who is visiting from her home base at UC Santa Cruz. Having met her many years ago while she was earning a Ph.D at UCLA, we’ve had some pretty involved discussions around Asian Pacific American media and the artists who are propelling the movement forward. Besides reuniting with former students Grace Su (an assistant editor on the film) and Phil Yu (an on-screen interview subject), L.S. 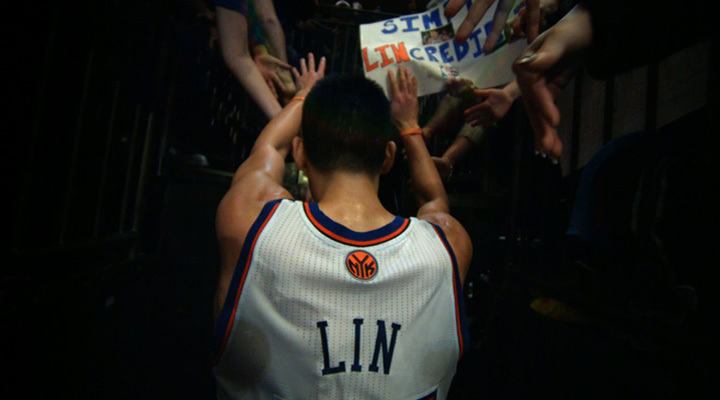 was keen to screen the film for its discussion on Linsanity and the racial blow-back that inevitably came with it. In a nutshell: just about all media pundits commenting on Linsanity pretty much failed to acknowledge Jeremy’s background as a San Francisco Bay born-and-raised All-American Boy, and instead resorted to the language of “The Other” in making their own assessment of why an Asian kid could outplay The Blacks at their “own” game. That failure, and the negative stereotypical media-speak that came with it, was certainly addressed in the film. To L.S., apparently, that discussion wasn’t as nuanced or as in-depth as she would have liked to see. As for me, I was still processing what I had just seen, and instead shared with L.S. my observations on the film’s cinematic accomplishments, centering on the bag of familiar cinematic tools that Evan marshalled to complete the film. Our conversation on the film then went into all kinds of different tangents, but I think the big takeaway I left for L.S. was that LINSANITY, as with the other distinctive non-fiction APA films I saw this week, evidenced that our community of APA cinematic artists have moved on to other stories and topics that are as important in building a fully-dimensioned portrait of contemporary Asian Pacific Americana. I think the expression I mentioned was, “Our APA filmmakers at Sundance have other fish to fry,” or something to that effect. For me, LINSANITY’s importance as an examination of race and media matters isn’t important as it is a celebration of a uniquely American success story. The race thing inevitably comes with the territory, of course — with stories about people of color, how could the subject NOT come up? I think, though, that LINSANITY’s existence in the year 2013 brings it in line with a current generation of Asian Americans who find out about people like a Jeremy Lin, or for that matter a NigaHiga, KevJumba, Wong Fu almost instantaneously. Acculturation, instead of fighting the notion of “The Other,” seems to be the new battle we fight — is it inevitable? What do we gain by it? And what do we give up? Those are questions that LINSANITY, The Movie is not really equipped to answer. And I wouldn’t expect it to. It wouldn’t be fair to saddle the film, and director Leong, with those expectations. It’s up to the viewer to make up their minds as to what the film says to them. And at the end of the day, that’s all we can expect from the moviegoing experience.